Every so often Nintendo puts up obscure activities on their many random subsites they have lurking about, including their "Play Nintendo" brand. 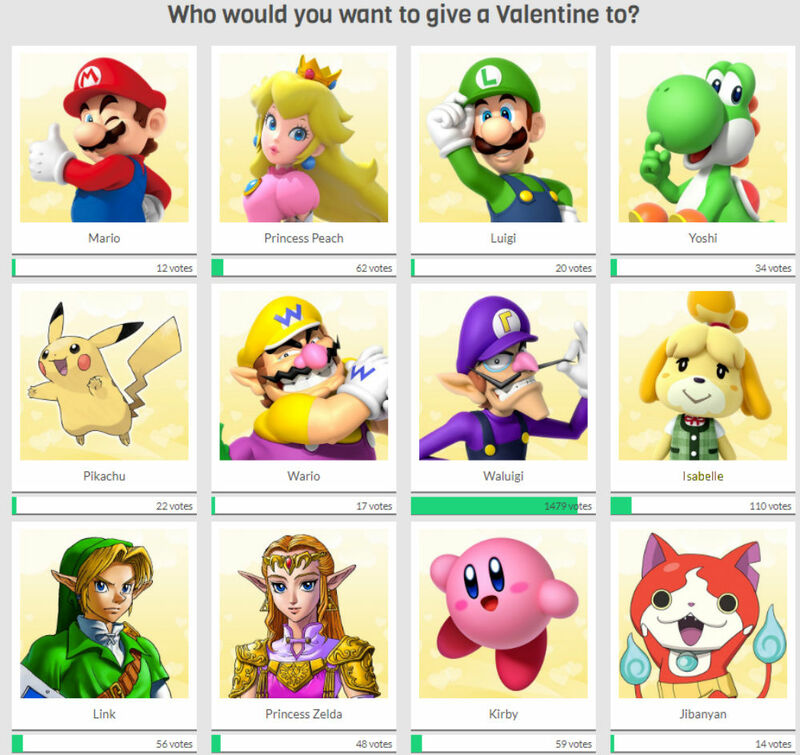 One such oddity was a Valentine's Day poll simply asking: "Who would you want to give a Valentine to?" Entrants included Mario, Peach, Luigi, Yoshi, Pikachu, Wario, Isabelle, Link, Princess Zelda, Kirby, Jibanyan and...Waluigi, who ran away with the thing by a landslide. Now you may blame this crushing win on his staying power as a meme, but I recall being just one of many grassroots Waluigi fans when he debuted back in 2000: he's always been a fan favorite. Although Nintendo of America president Reggie Fils-Aime, among many others, have downplayed the possibility of Waluigi in Super Smash Bros. (stopping short of calling him a "dead meme"), you really have to think that one day some executive somewhere will go "fine, make it happen!" after he's won his 1000th fan poll or they've seen their 100th petition. In non-Waluigi news, it warms my heart that Jibanyan, a spirit cat from Yo-Kai Watch that loves chocolate and was killed in his former cat life by being hit by a car after saving his owner, is even on the list: much less beating out iconic first-party Nintendo characters like Mario.